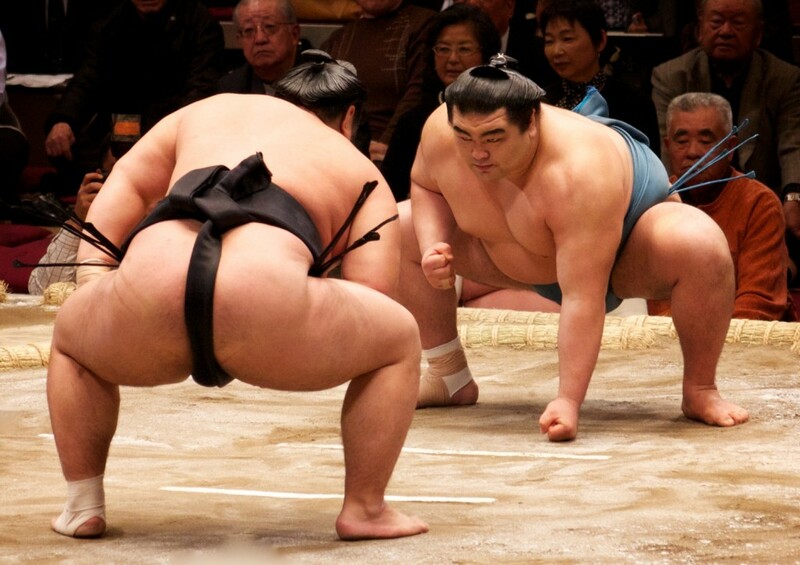 When I used to hear the word "sumo," I always pictured giant men in cotton thongs. Then, I moved to Japan and went to a real Sumo tournament at Ryougoku Kokugikan in Tokyo, and my opinion was never the same. When I used to hear the word “sumo,” I always pictured giant men in cotton thongs just waddling around intimidating people. 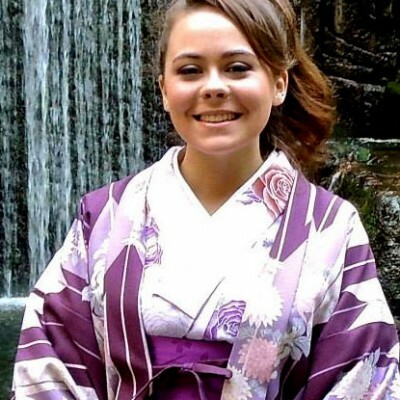 Then, I moved to Japan and went to a real Sumo tournament at Ryougoku Kokugikan in Tokyo, and my opinion was never the same. If you have any doubts about visiting a Sumo tournament during your stay in Japan, think again. This, just like any other event you will attend in this country, is filled with tradition and rich culture that dates back hundreds of years. I joked that the rituals before and after each match took up 99% of the day, but it’s actually true. You will hear the referees chant over and over again, but each time it remains awe-inspiring because of their commitment to keeping the tournament’s rituals the same as those of the original Shinto practices. Incredibly, Japan has yet again maintained the original purpose of one of their long-held traditions through these tournaments. I bought my tickets online from the official Sumo Association website and picked them up at the local 7-Eleven store. When you choose your seats, you will be given a number of options including “box seats” which hold 4-6 people, and “chair seats” sold in singles. 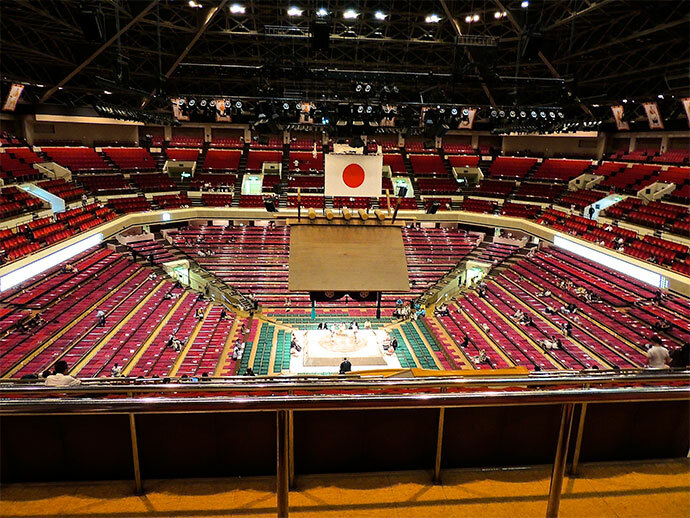 Of course, the more expensive seats get you closer to the action; but be warned that the box seats consist of traditional-style zabuton (座布団) [seat cushions] with no back, and seemed to be fairly uncomfortable if you haven’t gotten used to the Japanese way of floor-sitting. I enjoyed sitting near the back row of the stadium so we could get a good look at everything, but it’s definitely up to your personal preference. They also have general admission seating that is sold the same morning at the gate, but I’ve heard many people were turned away unless they showed up at 6:00am, and I didn’t want to take the chance. After buying the tickets for a weekday, I found out that the tournament starts around 8:00am and ends later in the afternoon depending on how the matches go. So I thought, “we have to get there early so we don’t miss anything!” I was wrong, the stadium was almost totally empty in the morning. It was pretty great having most of the place to ourselves and watching the matches regardless of the amount of viewers. Afterwards, we enjoyed some delicious hot ramen at a small noodle shop inside the stadium. We ended up leaving before the final matches were over but I enjoyed every minute of my sumo experience, despite my preconceptions. Once more fans started coming in around lunchtime, it was really fun to see how this typically quiet, peaceful people reacted. There were all types of fans: the serious, die-hard Sumo fans who pre-ordered front row box seats and sat silently, watching and waiting. Then people like us were sitting near the back, enjoying a conversation and a snack while trying to figure out what was going on, but all in a quieter spot farther from the doyou (土俵) [ring]. But the most surprising fans of all were those who were drinking and yelling at the wrestlers from their 15th row seat. They would raise their voice, clap and cheer, and get extremely angry when their favorite wrestler didn’t win the match. It was interesting, after breaking it down into different types of fans, you could almost compare the Sumo fans to NFL or NASCAR fans that I would see back in America. Especially the louder type; of course, this is an overgeneralization, but it was fun to see that even in such different cultures some fans still react with the same passion. I may not have had that same understanding and passion for the matches, but I definitely enjoyed watching the others who did. When we were leaving, we got to see some of the higher-ranking wrestlers arrive. There were dozens of fans standing around them yelling and cheering, all in an orderly fashion, of course. All the while, the wrestlers just kept their solemn faces as they walked through the crowd. Despite some of the fans inside the arena reminding me of home, this setup outside reminded me that I was still surrounded by pleasant, respectful Japan. Needless to say, there was no rowdy tailgating or barbequing going on outside. You can bring in your own food and drinks! They were very relaxed compared to American sports events. If you didn’t bring snacks, they sell food along with drinks and souvenirs that are allowed in the seating area. Take lots of pictures, and take advantage of the fun photo booth (purikura (プリクラ) with the Sumo background! 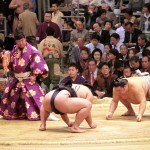 Most of all, put aside all of your preconceptions of Sumo. This is a thrilling, fun, and culturally interesting event that is unforgettable for Japanese and foreigners alike. I am so excited to see this! We got tickets for September 14th! Hi Kelsey! This was interesting to read! I’m living in Korea but enjoy weekend trips to Japan from time to time. I was highly considering a trip to Fukuoka to go see the sumo competition (Fukuoka just because I havent been there, but have been to both Tokyo and Osaka already). I was wondering.. if I buy a reserved ticket, then I can just arrive in the later afternoon and see the “best” fights, right? I would love to enjoy the whole show, but since we would go just for a weekend, I think we’d rather do other things in the morning and have a proper lunch (maybe chankonabe :D) before the matches. What would you advise? 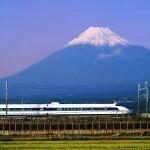 It's been fifty years since the first run of the Shinkansen brought the age of the bullet train to Japan. GPod 15: Let’s Talk About Sumo! More than just two big guys in diapers, sumo is considered by many to be Japan's unofficial national sport. With a long history, complex rituals and spectacular matches, sumo is a fascinating journey into the heart and soul of Japan. 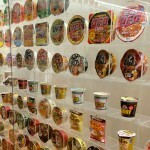 Of course Japan would have a cup noodles museum.